Most probably the best non-celluloid plastic ball. Perfect roundness, unsurpassed roundness, and consistency. Made in Japan from special poly material, which is produced exclusively for Nittaku. The official ball of the Liebherr 2017 World Table Tennis Championships. Approved by ITTF. With the Nittaku 3* you're pretty much just paying for industry leading quality control. Rarely will you have an egg shipped in one of these cartons. If you compare it to another poly ball that's properly round, the playing characteristics while different, are hard to characterize as better or worse. Most people end up complaining about one ball vs another because trajectories differ from what their used to and they have to pay more attention to what they're actually doing instead of closing their eyes and swiping at the ball. Although very expensive, it's worth to try them. Very good quality, but I still would choose Double Fish 40+ or Tibhar 40+ for training and matches. Best Balls on the Market. Quality products and fast delivery! Maybe it's just been my luck, but this batch seems to be breaking more often than usual. Still a great ball. Very high consistency and continuous use for 2-3 weeks. This is an excellent ball when new. The roundness, consistency of bounce, and spin set the gold standard for 3-star 40+ balls. The ball is very resistant to breakage. Its one glaring fault is that after just a few hours of playing time the ball becomes polished into a slippery, shiny ball with poor spin grip. I notice this so easily because in every other way the ball lasts such a long time. Given this fact, the ball is overpriced. These Nittaku 3 star balls are great, but expensive. Good balls. Came for 15 days with continuous play for 2-3 hours daily. Bounce too good even on amateur tables. Of course, this company's premium has been very dependable through the years. Very good ball. Maybe, the best for consistency. I prefer this ball to all others I have played with, and I think I have tried all balls on the market. I noticed however that the last generation of Nittaku premium balls break more easily than before. Invariably this happens at the seam. A+ quality Made in Japan! Love playing with these. Slightly heavier than other 3 star balls I have played with. Good quality and durability. .
Other plastic balls have improved, but the Nittaku Premium is still the most consistent and true bouncing among them. The early breakage problems have receded as well, I haven't had one break soon after taking out of the box lately, which used to be a problem. Best balls I ever played. Best balls for the game. Качество как и следует на высоте. This is second time I buy these ball and I'm very happy with quality. Nice weight feel when hitting the ball, perfect roundness and good trajectory. Will get back to endurance review once I manage to crack one ball, so far so good. 17/09/2018 Best Ball Made Review by David R.
I agree with all of the reviews saying this is the best ball made. I like the celluloid version better, but some people don't want to use celluloid balls at leagues, or even for practice. Go figure. The Nittaku "J-Top" ball is also an excellent choice. Bola de calidad superior, giro perfecto y resistentes. Great price! I use them all the time! Thank you TT1! Very good ball, doesn't jump from racket as some Joola products. A little bit heavier than I had before, but you feel each touch. Want to test 2 stars from Nittaku. I don't think the balls sound and the bounce the same between different batch. This time I am 100% satisfied. So far the best and durable plastic balls in the market. Hard feel, grippy, easy to impart spin and it's fast and durable. Expensive, but good. Feels good and gives a good performance. The only downside is the price. This ball has everything you could want, is is very bouncy and extremely consistent, probably the best ball I’ve tried. It is also extremely durable, I used to use the j top training ball from nittaku and would break 1-2 for about every 2 hours I’ve played. Almost 7 broken balls a week! I have had this ball for a month and not lost a single one. Best ball for all players. I like this ball very much, it is very easy to use to it. These balls have been great, the longevity is amazing. Broke 1 ball after 10 hours of play, the 2nd ball is around 30 hours of play, and the 3rd ball is still in the package. The balls feel a tad heavier than others and always bounce consistently on the table. Definitely a top pick! 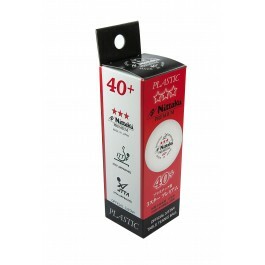 Probably the best 40+ plastic ball available but the price point prevents me from giving it a higher rating. After playing with celluloid balls for over 20 years (38mm is still by far my favorite! 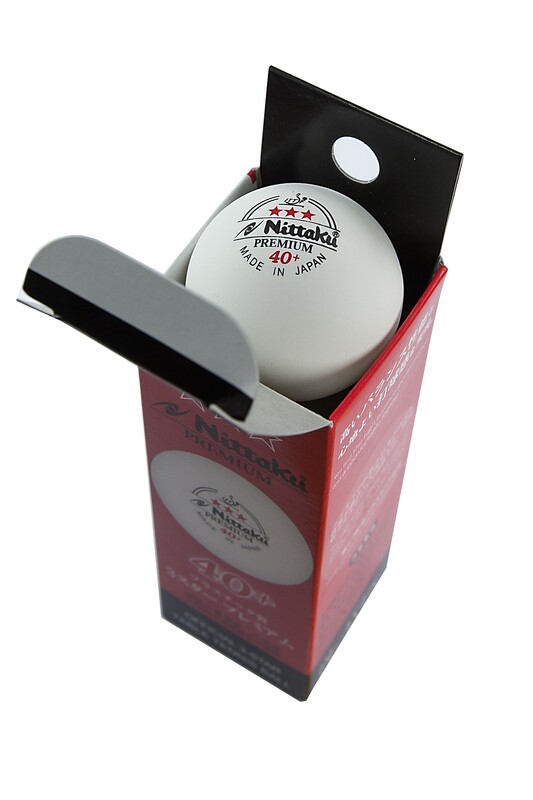 ), Nittaku 3-star (made in Japan) are the closest to the "old" balls. Arguably they're also the longest lasting poly balls. Worth the money. I'm glad I finally picked up some of these. It's the only ball we use at my local club. Top quality. No doubt, this is the best ball on earth! The only drawback is the price! Best ball in the market! I still find that all the plastic balls behave a little worse than the celluloid ones, for example, when smashed they sometimes do not bounce true -- my best guess is that they deform so much on contact with the table that they rebound based on a flattened shape rather than a spherical shape. They also seem to spin and bend less and are more prone to being hit "flat". That said these Nittaku Premium play as true and consistently as any other plastic ball I've tried, and much better than most. It's the same game, just a bit of an adjustment. Hard and round ball. Not a bad quality. Colour is not white, but more to yellowish. This is the highest rated TT ball. True bounces and long lasting. Everyone only wants to play with this ball. Great ball, but everyone knows this. I feel is best ball on market. Durable and true. Cost a little more but worth the cost. I hope all the other manufacturer reach this level of quality. so we can see some reduction in price. Can’t go wrong with the official ball from USATT Competitions. They’re 100% original and great to play. So far the best balls in the market. Fast delivery, thanks to TT11. Always the most consistent plastic ball. Best of the plastic balls... little bit heavier than some. Its a shame for the sport that there is so much variation in behaviour, across different brands of 'so called' 3* plastic balls! Great balls, last long time , fast delivery , good prices. Good balls, but a little expensive. Overall product quality was good and delivered on time as promised. I am quite happy with the durability, bounce and standard of the ball. These are probably the best 40+ plastic balls made so far. As expected from Nittaku, well balanced, sensitive on every type of strike and worth of money. Hard and heavy, perfect bounce - simply the best. The price is high but I think it's worth it. Hard to play with other balls having adjusted to these ones. All the reviews I have read put these as the best. I have tried others but always come back to the Nittaku. I find this ball not so durable at all after playing this for 1 month it split in half after constantly hitting on the wall when playing,i dojt know if the durability is the case or its just because of constant gitting it on the concrete walls but as for the performance its an excellent ball. Nittaku always make good quality products. Thanks to TT11 for giving nice price. Durable when I use them to practice serves and use them for rallies with my team. 3*s are no joke Nittaku has outdone themselves with this product. The material feels nice even though they get a little scratched up after a few uses. These balls (along with Xushaofa ***) are probably the best plastic 3* balls I've tried so far. White chalk comes off the ball when brand new and you have to clean your racket in the beginning but the bounce is the best and most balls are true (round). Watch out for a big swing and it hitting the top of the racket as they do crack but I haven't met a plastic ball that doesn't. Прекрасные мячи, очень доволен покупкой и Прекрасные продавцы!!! 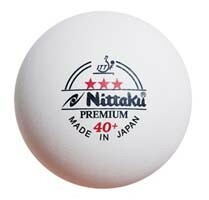 People's opinions vary on plastic balls, but the Nittaku 40+3*** is my favorite. It has a hard feel, a good sound, and a predictable bounce. My only complaint is that occasionally, I find a ball with a less than perfect seam, but it's still the only ball that I and most of my club members buy. I've played with XSF, Butterfly G40, Kingnik, and the Nittaku polyball. The Nittaku plays the most consistent and is the most durable of the three. I prefer it leaps and bounds over the polyballs. I expected a little more from It. The ball is solid, round, very high quality. Little heavier than other brand. In our TT club, almost everyone uses it in the game. An excellent ball. Quality and durability fully justify the price. The spin is not as strong as DHS. Overall good, last longer than most other manufacturers balls. Nice even bounce. Perfect, although DHS D+ seems to be the future choice. Lucshie shariki v Nastolnom tennise. Very good. It feels a little heavy and less spin than seamless bsll. Wonderful balls. quality price ratio is cheaper than any other ball. lasts a long time. High quality plastic balls it is a pleasure to play with. LUCHIJE shariki v Nastolnom Tennise. great balls with brilliant control. Do not buy this if you plan to play with other balls too. Once you play with these, you dont want to play with others! I have tested the 3 star comparison pack sold by tt11: xiom, joola, nitakku sha, nitakku premium, dhs and xushofa. Legendary quality and durability, I prefer these over any others. First choice when it comes to match or tournament ball, no doubt about it! Weight is just right, perfect round, last an incredible amount of time. The 40+ weighs 2.4g vs the old 40 (2.6g). They played similar with a harder, solid feel and very grippy for looping. Very consistent. So far this is the best 40+ ball that I've tried. We only play Japanese Nittaku Premium 40+ in our club. Fully satisfied with the accuracy of the balls. It's really best ball for current moment, for my opinion. The main cons of ball that is he much heavier that other plastic ball and if have (forced) to play with other ball you become feeling like you are playing by quill. P.S. Ball costs his money! Хорошие мячики - очень понравились. Plastic balls are notoriously known for being easy to break. These balls are the longest lasting ones I tried, last much longer than Butterfly 3 star balls. Feel is also solid. I would buy them again, and of course from tt11 as they have unbeatable service quality. I give them 4 stars only, due to a general complaint about plastic balls: like w** were they thinking to change the ball material and make table tennis much less fun than before. Of course they are good at it, since they also invented 11-points games, which would end before you even feel the game. Seriously, if you just want the game to be more random, you can invent another rule: toss a coin to decide who wins, and everyone can just go home. You don't need to worry that Chinese is dominating the game any more. When plastic balls started coming into distribution, there was a lot of variability in quality. Even Nittaku's Chinese made plastic balls had me wishing for a celluloid ball to play with. Today there are many brands on the market, but I love these balls for their consistency. They spin well, sound good, and are towards the heavier side on weight, which makes them play well with the new "made for plastic balls" rubber. 04/11/2016 Great for games. Review by R. D.
Ordered two of these and so far each ball we've used has been identical. Clearly a quality checked batch of Nittaku balls. You can count on these during games. First by tradition and later for proper experience, Nittaku balls are far the best balls. The price is a bit high but in terms of its durability, they are really something else, specially the seamless version. ~20% balls die in few first mins with simple top spins or non-100% power smashes. Funny fact: all my balls survived after hit with edge of racket. I have never used balls better than these. I regret buying ten packs because so far none broke nor cracked. I love the rough surface it still maintains after hours of hitting. Though dearest, it worth every cents you spent. These balls are perfect in all respects. After I first tried them half a year ago, I stopped using all other balls. 75% of these balls are very robust and last for weeks until they lose grip, while 25% are fragile and break in 5 minutes. So, I always have 3 balls with me for a tournament and never run out of them. In the clubs where I train and play, I see more and more other players switching to these balls. 19/10/2016 buenas Review by Luis Antonio Núñez A. These balls are the most consistent I've used in a long time and are worth having a few for serious competition. The most durable ball in the world. The most round ball in the world. Quite pricy, but the quality is superb. The balls are horrible worse balls I have played with in a.lomg time. Nittaku use tonbeu favorite balls, but this are something else. Not sure if that was a bad batch, but they are almost not plYable. Sound horrible worse the the butterfly balls, very soft. I'm very disappointed with this balls. Absolutely the best poly balls out there! NA Dannij moment samije luchije shariki.Poka Luchix ece ne sdelali. I bought this product many times, in my experience this ball only play longer for 70%, another 30% very easy to block. На мой взгляд лучшие мячи доступные любителям на сегодняшний день. If I didn't know it was plastic I'd might guess it be celluloid. And I have tried Xushaofa. Which is also considered one of the best. These should be used in tournaments. Comparing with other brands, Nittaku 40+ 3*** is the best. They are more consistency, while other brands may seem cheaper but after taking away a half of the balls, the cost nearly the same. Best and most expensive plastic ball ever. Best plastic ball you can get. All balls are ideally round. 10% to 15% of these balls break right after you start using them, after 5 or 10 top spins, not even a smash. But other 85% are very durable and have great grip after many hours of use. Pretty quality than others balls. You will like it. I used to play with DHS balls but I needed at least two of them per 2 hrs training session and most of DHS balls are not round, so I switched to Nittaku balls. I think that these balls are the best for playing with many rubbers especially with Tenergy, Acuda and Evolution MX-P. Long lasting balls, I played with one Nittaku ball for approx. 15 hours and label on the ball was almost erased before it was cracked. High quality product. It is the best ball from those that I had. at it very good rebound correct form and weight. it is enough for me at least for 10 trainings. Very nice poly ball. Has the best longevity of the poly balls. Ball plays very well. I find this to be the best polyball on the market right now. Great texture, roundness is very consistent, a standout of the polyball era. best and long lasting balls for table tennis. Я поставил в описании цену среднюю, т.к. считаю, что цена на все мячи завышена изначально. Что касается этих мячей - выгоднее их, только Neottec training (я тестировал ещё Andro Speedball 3*, ShildkrŐt 3*, Tibhar 3* Seameless, Yasaka 3*) - все мячи куплены на http://www.tabletennis11.com / Естественно целлулоидные в расчёт не брал - они превосходят пластик во всех компонентах. Я поделил количество протестированных мячей на количество сыгранных ими сетов, и в итоге получил стоимость 1 сета в переводе на Евро. Итог Нитакки 0,031 Евро стоит сыграть 1 сет (самый выгодный Неоттек 0,027 Евро за 1 сет), остальные протестированные показали худшие показали, в 2 или даже 3 раза. Качество поставил хорошее, т.к. отличное будет когда добьются долговечности целлулоидных мячей. Общее впечатление - все мячи идеально ровные, играть ими приятно, по игровым ощущениям ближе всего к целлулоиду. Excellent quality. Nice texture, roundness very consistent, plays very well. NO PROBLEMS HERE. Highly recommended. the best poly ball on the market, the bounce is incredible is well rounded, and last longer, very much longer!! В упаковке все мячи ровные. Прочность на высоком уровне. Не взвешивал, но по ощущениям немного тяжелее, чем все остальные имеющиеся на сайте. Been using the same ball for 2 months and still in great shape. Best polly ball so far. Great texture, great bounce, nice looking, balls DO NOT vary in size and roundness...very consistent, TABLETENNIS11 has the best price and makes table tennis very affordable and fun to play. The best new poly ball (seam) in the market. Awesome result and bounce is very regular and consistent. These last a long time and play the best! Given the fact that a lot of tournaments are using different poly-balls. I do not know which ones to stock up, so I bought a couple of these balls. It feels different from that SHA+ balls, too expensive. excellent balls but the price is a little bit high. Wish the balls would last a little longer. 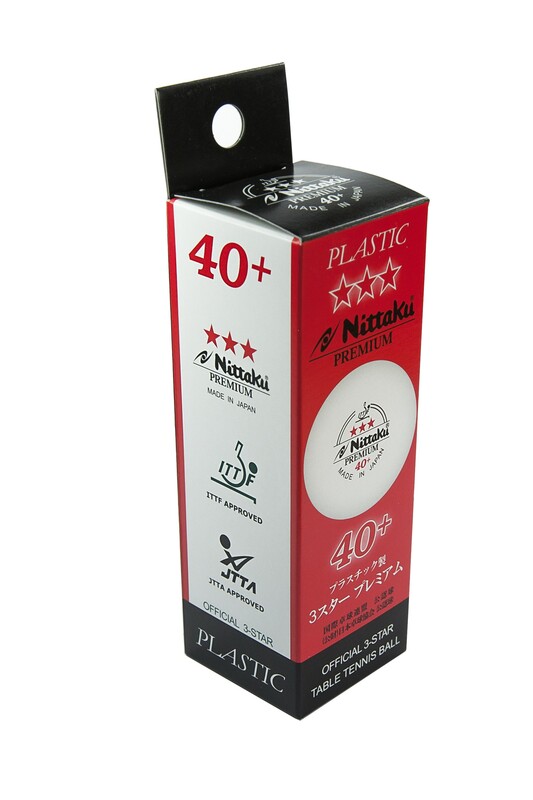 Nittaku Premium 40+ is the best table tennis plastic ball that have played.